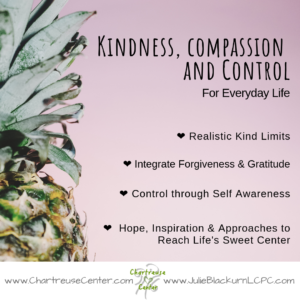 What a great webinar about Kindness, Compassion and Control. Identify Expectations… move the unspoken expectations into the spoken to reduce assumptions and confusion. Clarify by obtaining or adding more information to reduce ambiguity and add transparency to your intention. Determine what you need to take into consideration for yourself… this is a simple act of self care. Determine what you need to take into consideration for others… how will your decision impact those in your life? Stay consistent… Do what you said you would and this begins to build trust with those in your life. Remember, anytime you make an adjustment like this in life, others in your life may resist at first. Eventually, you become known for being honest, open and trusted to do as you said you would. Marrying forgiveness and gratitude creates a compassionate mindset. This can be done toward others or toward yourself. A statement of forgiveness can be as simple as “I forgive you for your not knowing…” to release that pain felt when someone has said or done something that was insensitive, unknowingly ignorant, or hurtful. A statement of gratitude reminds us of the positive in our lives. Control increases when we develop a personal awareness of our own hurts, pressure points and purpose of sharing thoughts . We choose who we surround ourselves, how we communicate and how we respond. It’s important to understand what we hold onto and where we stop and start. Download the Kind Limit worksheet here. Stay informed of other upcoming webinars that are simple gifts to you by joining the email list, then you’ll be the first to know when the registration opens. ← Through the Love of Music!